KUMAGORO: Well, it looks like the last event of the year it's Vintage! Or better, a form of Vintage that's been purged of all the Power 9 and other problematic cards, including all that we already ban in Legacy events. 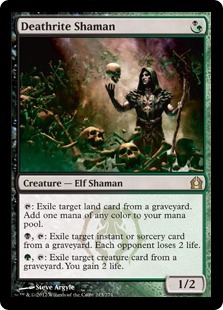 The one card I especially care about in this de facto extended Legacy pool is Survival of the Fittest , which naturally lends itself to a specific form of repeatable reanimator, once paired with its historical Exodus pal, Recurring Nightmare . 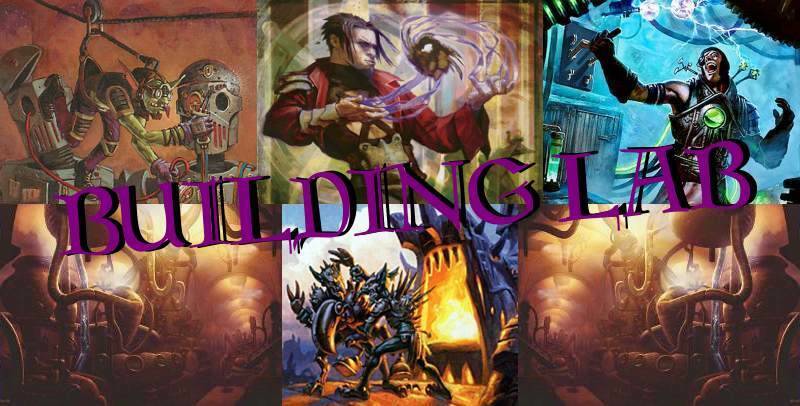 Care to join me in building a RecSur Tribal deck of some sort? GENERALISSIMO: Well, I have absolutely no clue what I would play in Vintage otherwise, so I would love to piggyback off your ideas collaborate with you. 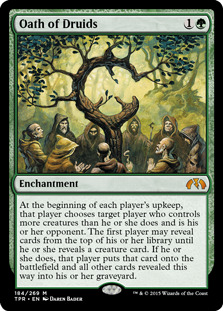 Do you have any thoughts about what tribe to pair with the enchantments? Obviously, I'm just chock full of suggestions but I wouldn't want to step on your toes... or something. KUMAGORO: I think we can do sort of a freestyle riff on the RecSur idea. We may agree on the tribe and colors, or not. There's also going to be a fair number of off-tribe creatures we'll use, either as silver bullets or finishers, because the deck is quite naturally a toolbox (in fact, it's the original and ultimate toolbox). One of these can suggest the tribe. I think we can easily find tribes that suit the concept well, but within the mandated 20 tribal slots we'll inevitably have to make do with some second bananas, whereas the toolbox is about the most excellent of the options at our disposal – which are ALL the options, since we're in Vintage! 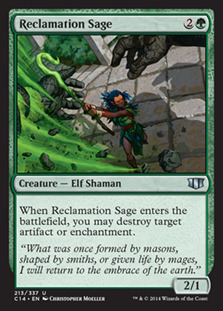 For instance, we're in green, so I assume we're gonna play either Reclamation Sage or, if we splash white (I'll certainly do), Knight of Autumn as noncreature removal. 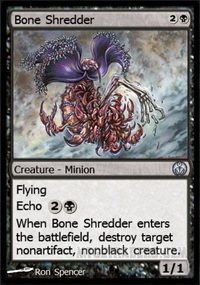 Against creatures, there's a ton of black candidates like Bone Shredder , Ravenous Chupacabra (non-conditional but less easy to hardcast) or Skinrender (better against regenerating and indestructibles). 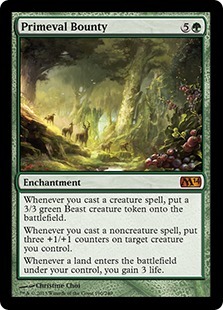 I also had the best experience with Big Game Hunter when I was playing RecSur in one of the Classic events BlippyTheSlug used to host: my opponent had just triggered Oath of Druids fetching Emrakul, and I immediately discarded Big Game Hunter for his madness cost, killing the big Eldrazi on the spot. It's situational, but we're bound to face larger-than-life finishers even with Oath banned. GENERALISSIMO: Fortunately, I was able to have some of my own, non-fictitious ideas over Christmas. 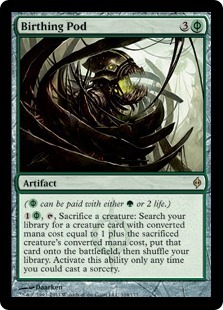 Firstly, both Survival and Nightmare are pretty mana-hungry and able to make use of redundant creatures, so mana dorks seem like a given and this is a perfect opportunity to dust off those Deathrite Shaman s that were recently forced into retirement. Secondly, we're running two important enchantments that are also completely pointless in multiples, so maybe just a couple of each plus some tutors would allow us to maximise consistency while minimising redundancy. 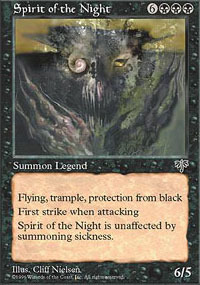 Thirdly, the most powerful thing that I'm aware of to repeatedly reanimate and sacrifice with Nightmare is Yosei, the Morning Star to lock all of the opponent's permanents down. 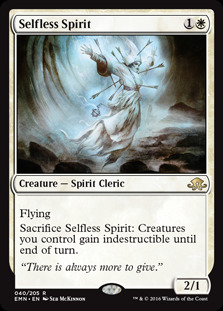 Actually, Spirit has a few things to recommend itself as a tribe: Demigod of Revenge can do an (admittedly significantly clunkier) impression of Vengevine ; Nether Shadow and Nether Traitor provide recursive fodder for Recurring Nightmare; Custodi Squire, Karmic Guide and/or Carven Caryatid generate advantage; and Karador, Ghost Chieftain is a card I've wanted to play with, and this seems like as good an opportunity as any. The tribe does suffer from a lack of acceleration and interaction, though, so it might be a challenge for the off-tribe creatures to cover all of that. KUMAGORO: Spirit is certainly an interesting tribe. 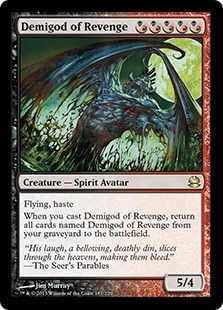 Demigod of Revenge is a good card (it doesn't work with reanimation, though, you have to hardcast one to resurrect all the others, but it's feasible). 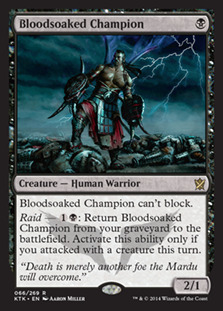 Of course Bloodghast would be useful here, but it's too expensive to acquire. 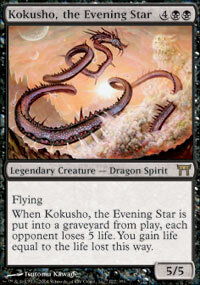 Kokusho, the Evening Star is another good finisher, you switch it back and forth a few times and it's good game (although it worked better when having two copies at once on the battlefield would kill – and trigger – both). I absolutely agree that we don't actually need more than one or two Recurring Nightmares, especially since in Vintage there's plenty of ways to search for it, like Demonic Tutor and the likes – as far as strictly Vintage cards go, I'll only buy that one for the occasion, plus a Strip Mine ; they're both cheap enough. 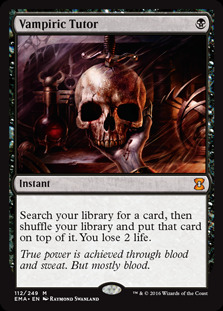 Vampiric Tutor is cheap too, but I'm not sure I'll find the room for it. Ditto for Sterling Grove , which should be a given in the deck. GENERALISSIMO: Oh right, yeah, Demonic and Vampiric... I totally remembered that those cards existed and wasn't thinking of anything stupid like Idyllic Tutor . KUMAGORO: This said, don't make the mistake of running less than four Survival of the Fittest; the deck needs it badly, always, and as soon as possible. It's the way you search for everything and are able to turn any fattie in your hand into value. 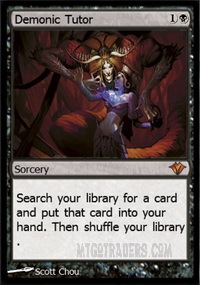 In fact, a RecSur deck could paradoxically not run any Recurring Nightmare at all, since you have Loyal Retainers that the Survival can directly search for (plus other creatures that do the same but less efficiently, like Doomed Necromancer ). I'll follow this route, running the deck within a Human shell. So I've got the Retainers, I've got Bloodsoaked Champion for recursion, I've got Nekrataal and Big Game Hunter for creature removal, and many utility players like Eternal Witness , Ethersworn Canonist , Orzhov Pontiff and Deadeye Tracker (which, granted, is poor man's Scavenging Ooze , but I won't have room to run too many off-tribe creatures, so the more in-tribe solutions I can pack, the better). Also, I've got Zealous Conscripts , which completes my plan of using Kiki-Jiki, Mirror Breaker as main reanimation target for the Retainers. I mean, it's a deck where almost everything it's Kiki-Jiki material, no? 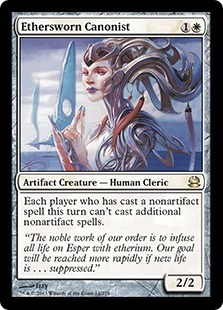 I can also include one Teysa, Envoy of Ghosts from my previous, legend-based Human deck that I didn't really get to play (there was also Crovax, Ascendant Hero as curve-topper in that one, but he's self-defeating here; maybe I'll find a way to include an actual Elesh Norn, Grand Cenobite ). Teysa doesn't particularly shine, but since I have 20 Human slots to fill, and I don't need many full sets of them, I might well reanimate her in a pinch. So the plan is: discard anything to get Conscripts, discard Conscripts to get Kiki-Jiki, discard Kiki-Jiki to get Retainers, cast Retainers and win if they don't have removal (so maybe some form of protection would be good, too). I'll include one straightforward finisher as plan B, I think I'll go with Akroma, Angel of Wrath , following in the footsteps of the original RecSur deck with which Brian Selden won the World Championship exactly 20 years ago, and which had the proto-Akroma Spirit of the Night as its main finisher. That's an interesting list to study. 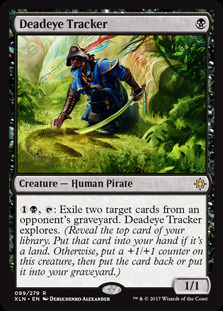 For acceleration, Deathrite Shaman sure is tempting, but even if I'll run eight fetch lands, I still prefer to go with tried and tested Birds of Paradise . I don't want to find myself in the situation of dropping a turn-one mana dork that doesn't actually accelerate because I don't happen to have fetch lands, or I've run out of them later. KUMAGORO: And I won't even be able to kill your Shamans with my Nekrataals. [SPOILER NOTE: Which also happened.] I want to use a full set of Wall of Roots . It's how we used to roll back in the time, and it's still one of the best green cards ever. Also, I'd like to use some copies of (Wall of Blossom), or at least one. 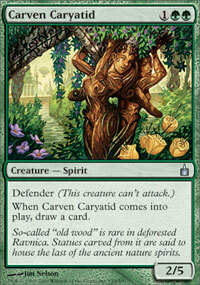 Having Carven Caryatid in-tribe is a good advantage for Spirits, though a three-drop is not the same as a two-drop. 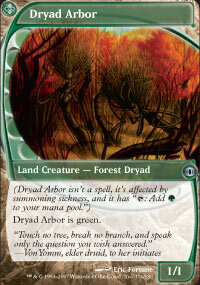 But its power makes it a better blocker against aggro decks. I'm pretty sure we'll have just regular Goblins in our Vintage meta. And Elves. I might want to double down on the Orzhov Pontiffs. GENERALISSIMO: Conscripts into Kiki-Jiki into Retainers: I can't tell if I'm just being an idiot and missing something obvious, but this doesn't seem like a chain that combos off; you end up with Kiki-Jiki in play but the Conscripts in the graveyard, right? KUMAGORO: Yeah, it doesn't work directly like that, you're right. I guess I'll either need a Recurring Nightmare or another creature to discard to get Kiki-Jiki. It's unlikely it's all done in the same turn, anyway. On second though, I imagine I'll probably fetch Akroma most of the times as a first option, but an infinite combo feels good to have, and both Kiki-Jiki and the Conscripts are strong creatures in their own right. Question: as a multi-purpose solution, Acidic Slime or Knight of Autumn ? GENERALISSIMO: Well, as a general rule, I'd say go with the three-mana choice over the five-mana choice. 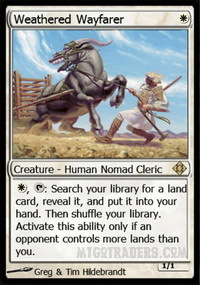 Unless we're expecting opposing lands to be a big problem, Knight just seems more efficient and more versatile. KUMAGORO: Lands could be a problem indeed. 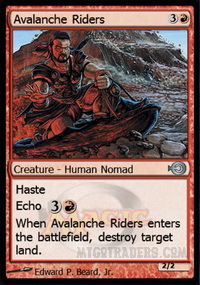 I could run Avalanche Riders in-tribe, but I'm not too convinced. In fact, I'm kinda thinking too many silver bullets might just not be an efficient way to go. Ethersworn Canonist might be too narrow to be worth having around. Or maybe not? Vintage Storm could be a tempting proposition to storm fans. GENERALISSIMO: It might be tempting to someone but I would kind of assume that a storm deck with twenty creatures would be pretty terrible, and I'm not sure it's worth the slot to try to fight it in that way. KUMAGORO: There's so many options. 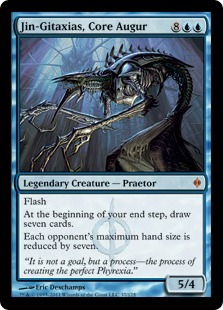 I'm considering Grand Abolisher for protection, but I'm concerned about my ability to consistently have two white mana, and most of all, do I ever want to start fetching the Abolisher before doing anything else, so that the opponent won't mess with my turn? I'm thinking not. 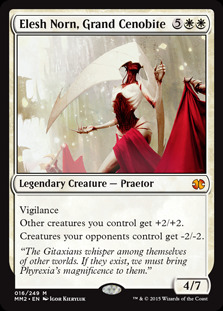 I'm also giving some thought on sacrifice as protection against exile (we don't care too much if our creatures die after all, as long as they don't get exiled). 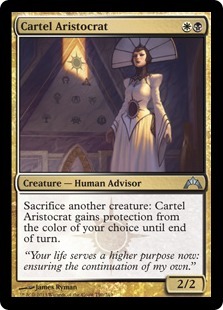 In-tribe I have Cartel Aristocrat , which doesn't seem ideal, and Thoughtpicker Witch , which does something moderately useful but the activation is not free of charge, so unreliable. GENERALISSIMO: A sacrifice outlet would also provide a way to ensure you have a creature in the graveyard to start Recurring Nightmare with when you don't draw Survival, but Aristocrat and Thoughtpicker seem a bit too low impact to justify a slot. KUMAGORO: I'm second-guessing Bloodsoaked Champion , too. Will I even be attacking in a regular turn? Well, I can maybe do that with a Bird. But it still doesn't seem too useful a creature. Do we even need that kind of recursion? Sure you need a creature on the battlefield for Recurring Nightmare to work, but I'll be running 32 of them, and after a sweeper, the Champion won't come back on his own anyway, so it looks like a bad interaction. I might want to cough up the 6 tix for an Ophiomancer instead, has more versatility. 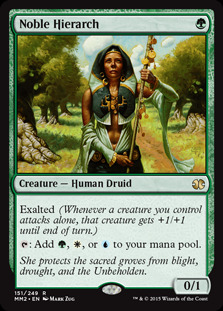 And of course if Noble Hierarch wasn't still so damn expensive, it would solve many problems in my list. 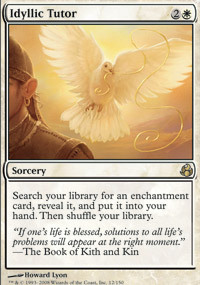 I might have to run poor man's version Avacyn's Pilgrim , just to free some off-tribe slots. GENERALISSIMO: Yeah, I've got to agree that two mana for a situational form of recursion is probably not worth it. The only time you're likely to want it is with Recurring Nightmare, which already eats up a ton of mana. 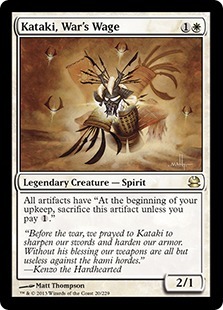 KUMAGORO: If you'll play Spirits, be advised Kataki, War's Wage is a must in Vintage. There will be tons of artifact-heavy decks. I'll readily admit that I have absolutely no idea whether this is going to be good or not; Survival is a complicated card to build around that I have no experience with and I'm not even sure what kind of decks I'll be facing. 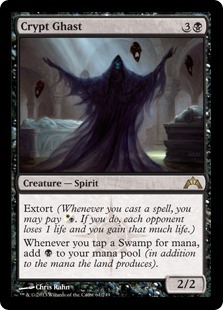 Things of note we haven't already talked about are: Sustaining Spirit , to lock the opponent out of damage along with Recurring Nightmare to sidestep paying cumulative upkeep; Dryad Arbor and Eternal Dragon , as land drops that can also be ditched with Survival; Selfless Spirit , to counter board-wipes; Crypt Ghast , for going nuts with multiple Recurring Nightmares in a turn; and Eidolon of Blossoms , as a draw engine with the enchantments. KUMAGORO: Oh, I see you've found room for Sterling Grove, too. I envy that. Selfless Spirit in-tribe is another gift from the Spirits. The very obscure (I think?) 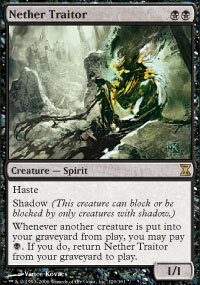 Sustaining Spirit seems great, but there's no way I'm playing a card with that art and frame. Since you run white, why not playing Knight of Autumn over Reclamation Sage? GENERALISSIMO: It's exclusively a budget issue; I'm just far too cheap to splash out for a Standard-playable card and for a deck that I'm going to play once. KUMAGORO: Well, Knight of Autumn has become an instant classic across the board, it shows up in every format. Also, we'll certainly do other Vintage events, maybe one or two special events next year. GENERALISSIMO: I'm sure I'll need to pick some up eventually, but I'm still holding out hope that it'll drop in price when it rotates out of Standard. As for other Vintage events... well, I'll just have to buy those bridges when I come to them. KUMAGORO: Not sure about Crypt Ghast. 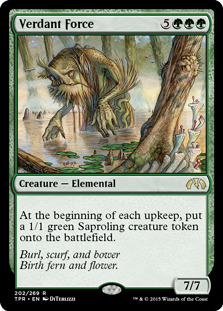 How many swamps would it double when Urborg is not there? GENERALISSIMO: Admittedly, I'm not 100% sure about Crypt Ghast either, but the potential upside is certainly high: going wild with a couple of Swamps and a Recurring Nightmare is a possibility I just can't pass up. KUMAGORO: Also, Eternal Dragon is because of the cycling? The other ability to fuel Survival seems a little bit too mana-intensive. GENERALISSIMO: Yeah, E-Dragon is 95% a Plains that costs two to play; I basically just wanted a way to cut into the tribal creatures rather than the off-tribe ones for more sources of mana. 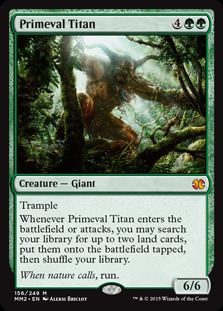 Unfortunately, the mana requirements for the deck are pulling me in multiple directions at once: Survival wants a surplus of green, Demigod needs five black, and Eternal Dragon can only search up Plains. I'm sure I'll fetch up the wrong land and screw myself over at some point, but at least that'll distract from the fact that I'm sure I'll also search for the wrong creature with Survival at some point. KUMAGORO: I would have played at least one Kokusho, it also gives you life in case you have to come back against burn and aggro. So, I guess Yosei is Plan A and Demigod is Plan B? It's a viable Plan B, but it kinda requires more effort, it pushes you into discarding multiple Demigods via Survival, then hardcast a five-mana card requiring all specific mana. Maybe you should add a second Urborg. GENERALISSIMO: I just didn't want more six-cost cards in a deck that's already so mana-hungry, plus Deathrite Shaman already offers incidental lifegain that's a lot less clunky. I think I'll have to wait until after the event to decide which plan is A and which is B; the more I look at my own deck, the less sure I am that the deck makes any sense at all. Oh well, at least if it's a disaster, it'll likely be an entertaining disaster. KUMAGORO: That's, like, our motto now. GENERALISSIMO: That's always been my motto. So in the end Canonist stayed in. I figured she could help keeping several kinds of opponent at bay, and I can decide when to get rid of her the moment I start a cycle of multiple Recurring Nightmares. I ditched Deadeye Tracker – just seemed too inefficient. 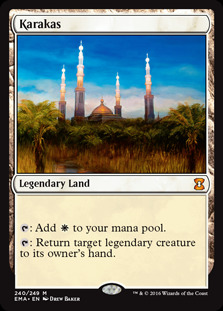 I'll fight dredge with Anafenza, the Foremost , which feels like a good card to bring along, and a little bit with a land-based sub-toolbox courtesy of Knight of the Reliquary , which is useful to fetch Karakas and Strip Mine too. I had three Eternal Witness at some point, because I realized I want to regrow Retainers to reanimate Kiki-Jiki, then immediately copy the Witness to get the Retainers back. In the end, one of the Witnesses has turned into Renegade Rallier , because he ramps early on by regrowing a fetch, and can regrow a destroyed Survival later. I've also added Aegis of the Gods . 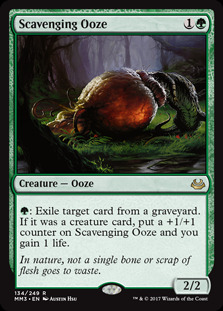 I wasn't sure at first, because it's frail, but then I read an article that noted how it's good especially in Vintage, because you don't have too much creature removal to waste there. Granted, it was referring to non-tribal Vintage, but even just forcing the opponent to redirect their Swords to Plowshares towards the Aegis, because otherwise they won't be able to target me with a burn or disruption effect, might still be good enough. I see we both doubled down on the one-drop mana dorks. I had 4 Pilgrims at some point, but then I didn't like that they don't provide green, while a cool feature of of Wall of Roots is that it can be used twice per turn to activate Survival: once in your turn, once in the opponent's. KUMAGORO: So, first of all, I've seen from your video you didn't enjoy the deck too much, partly because you had a literal headache while playing. Now, it's true Survival of the Fittest is a strategy that requires quick and complete knowledge of the content of your deck almost at any given time, much in the same way as Birthing Pod . In fact, to a great extent Survival does the same thing as the Pod, but the selection happens before you have cast either the "sacrificed" creature or its target, so you must have a clear plan in mind before committing anything to the battlefield. And of course the master plan (or plans) is constantly derailed by the board situation asking for countermeasures. GENERALISSIMO: Yeah, I think the biggest problem I had was not practising with the deck to get accustomed to it beforehand; all the games felt extremely messily executed on my part, and when I won it often seemed like it was because the opponent had some pretty unfortunate draws, which wouldn't be so bad if I wasn't also making a video to show it all off to everyone. I also didn't like the Yosei win condition much, as it required either being exposed to exile effects for a whole turn, or spending six mana to Recurring Nightmare twice in the same turn and trigger the on-death ability. The Demigods of Revenge actually felt like the less clunky path to victory as they could be incidentally discarded throughout the game and then brought back for an instant victory when the time was right, or at least just cast as five-powered hasty fliers when I didn't have a Survival, although the BBBBB mana cost was definitely an issue. How did your win conditions work out? KUMAGORO: As dull as it sounds, Survival decks should always incorporate the very simple, very straightforward plan of just setting up the reanimation of some big fattie finisher, I think. In my case, I never even attempted the Kiki-Jiki/Zealous Conscripts combo (I believe it happened once on its own). The go-to plan was always to get Akroma up and running. I could do it very efficiently: turn 1 mana dork, turn 2 Wall of Roots and Survival, discard something to fetch Akroma in the opponent's turn thanks to Wall of Roots, then on turn 3 discard Akroma to fetch Loyal Retainers, cast Retainers, attack with Akroma. It's just one beater that white removal could easily take care of at any time, as opposed to your four Demigods (which I believe was a very good plan) or the Yosei prison (which is a classic), but it's a very fast setup. GENERALISSIMO: Unfortunately, someone keeps restricting the most powerful reanimation targets to only their own tribe, so the best choice of fatty is not obvious. KUMAGORO: That makes it more interesting! If you had to choose a single finisher, what would you have played? GENERALISSIMO: Jin-Gitaxias, Core Augur , maybe; an early draw seven and force the opponent to discard to zero would be fairly universally powerful. It doesn't have that great of an impact on the board, though, so if you're behind later on, it might not be good enough. KUMAGORO: Jin-Gitaxias has some appeal, but I think it runs the serious risk of killing you before you find a way to actually win the game. Plus, do you really need to draw a lot once you have Survival online? It basically gives you half your deck in your hand already, and you want to keep using it, and then maybe recurring stuff, so chances are you won't have mana left to hardcast anything else you drew. And I'll let you know Inkwell Leviathan is not restricted. That would have been my purely "Spike" choice, I believe. 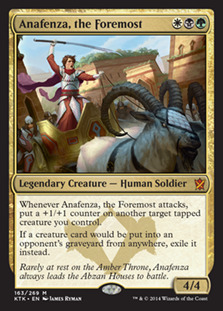 Though Akroma (or even her monored version) is still nothing to sneeze at. GENERALISSIMO: You could just Recurring Nightmare Jin-Gitaxias away again once it's forced the discard if you were worried about decking yourself. 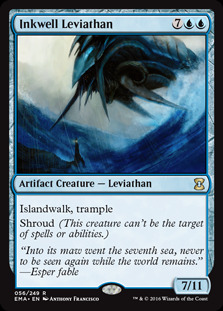 Inkwell Leviathan works, but it's just a three turn clock that offers no disruption, which won't necessarily be good enough against other combos or Cloudpost decks, or even against Burn. KUMAGORO: Did you look at the Vintage decks currently using Survival before the event? I didn't, I've done it now, it appears nobody plays Recurring Nightmare anymore, there's a popular and quite successful version that just dumps a set of Vengevine into the graveyard, then triggers it with Basking Rootwalla (Hollow One is also part of the equation). Not easy to replicate in Tribal Wars, though. Elemental shell? Lizard? 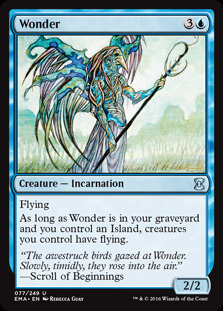 I see they also use Wonder to make all the Vengevines fly. That's something that could have been useful to have around. 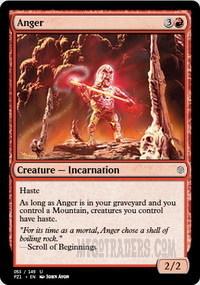 Anger too, perhaps. I think my main mistake, as I feared, was to overload the list with silver bullets that I kept drawing at ill-timed moments. I should have gone with just being a true combo deck, executing my plan as quickly and efficiently as possible without looking to interact too much with the opponent. 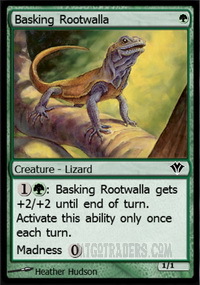 GENERALISSIMO: I was vaguely familiar with the Rootwalla-Vengevine plan and did look into Lizards, but I'm pretty certain you'd be forced into running too many filler Lizards that wouldn't do anything but get discarded. KUMAGORO: You have (Whiptongue Hydra)! But yeah, I'm pretty sure Lizard is a terrible tribe in general, more so with this deck. GENERALISSIMO: Elementals would make more sense, they offer some interaction with the likes of Shriekmaw , and reasonable fatties such as Verdant Force , but I think they might suffer from pushing the average CMC even higher in a deck that already uses a lot of mana. KUMAGORO: Assuming that we'll play Vintage again in Tribal Apocalypse (we will) and, in that case, that we'll play Survival again (I will), are you satisfied with your tribe? I think Spirit has a few very good members to exploit. Human certainly has a ton of useful effects, starting from Loyal Retainers, but I think I would have found a more solid package elsewhere. Maybe in Shaman, or in Elf. GENERALISSIMO: I don't think the Spirits were bad; there were some that I never really got any use out of like Kataki or Selfless Spirit, but that's probably just the nature of this kind of deck rather than a problem with the tribe. KUMAGORO: But as I was saying, maybe we shouldn't have played the deck this way, trying to have an answer to everything. Maybe all the off-tribe silver bullets should have been more tutors and fast mana sources instead, to just optimize the plan. This said, Kataki is probably the one hoser I'd keep at any cost in the deck, because Vintage, even depowered, naturally lends itself to artifact abuse. I had occasion to exploit Kataki against AJ_Impy's Shop deck (in our first game it almost looked like I was running a list specifically tailored to go against his). In matchups like that, it's just too powerful to pass. GENERALISSIMO: Here's a card-by-card breakdown of all my creatures. Demigod of Revenge : Like I said, was surprisingly good but the colour commitment was definitely an issue. It might be enough of a reason to want to change over to just BG. 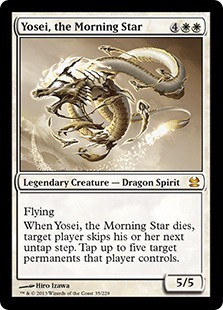 Yosei, the Morning Star : In contrast to the Demigods, this was worse than I was expecting; it did win me some games but setting it up just felt hopelessly clunky. It's possible that I just need more experience figuring out what situations call for a Yosei win, though. 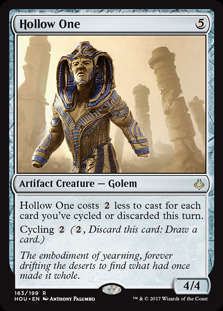 Carven Caryatid : A solid role-player and I think the card draw is pretty necessary to help draw into land drops and/or the critical enchantments. 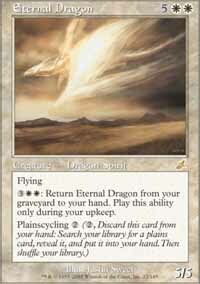 Eternal Dragon : Paying two mana to search for a land is basically never a great feeling but I'm not sure there's a good replacement in-tribe. Plus, it does help with ensuring there's a target in the graveyard to get a Recurring Nightmare chain started. 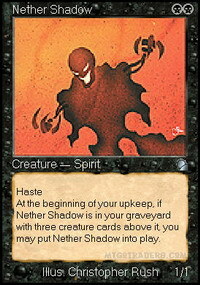 Nether Traitor : Occasionally useful but having two was definitely unnecessary. Crypt Ghast : I never got this thing going and I guess it's probably just too likely to be a four-mana removal target to be worth running, especially since the deck really doesn't need another card that punishes Swamp-light draws. 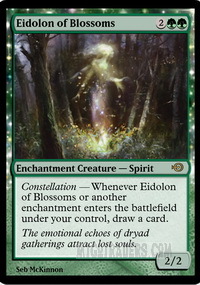 Eidolon of Blossoms : The enchantment synergies weren't nearly enough to compensate for this thing costing 4 mana, particularly since draws that include enchantments usually already have enough to do without drawing a bunch of extra cards. Being able to tutor for it with Sterling Grove was a nice extra I didn't consider when deck-building, but I'm struggling to imagine a scenario when it would actually be useful. 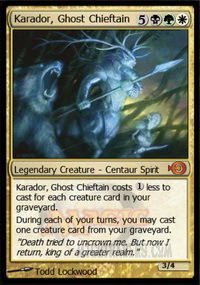 Karador, Ghost Chieftain : Without a Survival this is just a horribly overcosted creature, and with a Survival it still won't be the best thing to search up in the vast majority of situations. The only time it came up was to recur Sustaining Spirit against you, and even then it was just Karakas-ed into irrelevance. 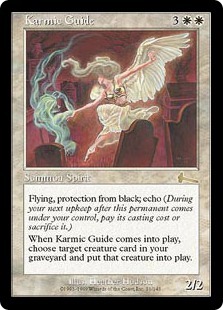 Karmic Guide : Was never really useful but might make more sense in a deck that went for a fatty-reanimating strategy like you suggested, as it's a reanimation spell that can be tutored up with Survival. Kataki, War's Wage : The only artifact-heavy deck I faced was Deonmag's Cloudpost Scarecrows, which wasn't exactly the match-up for Kataki to shine. I agree with you, however, that it's too potent (when facing the right deck) to cut, particularly since Spirits don't have to spend a precious off-tribe slot on it. Selfless Spirit : Didn't do much for me but I'm not really sure whether to blame for that the decks I faced or the card itself. At the very least, it can be sacrificed to put a creature in the graveyard to start Recurring Nightmare with. Sustaining Spirit : Well, it held you off for quite a while but I still ended up losing that game, and then timed out, so I guess this card single-handedly lost me a match, which is a less than stellar track record. Still, comboing with this is pretty much the only way for the deck to catch back up if it stumbles, as it doesn't require a bunch of mana to get started and intrinsically buys some time to draw other pieces. Birds of Paradise : Nothing to add here; acceleration and fixing are just vital for the deck. Deathrite Shaman : It did suffer from running out of fuel for the acceleration ability, just like you predicted, although some of that was my own incompetent mishandling of it by eating lands when it wasn't necessary and, generally, it was only an issue when I had more than one of them, so maybe 3 would be a better number. 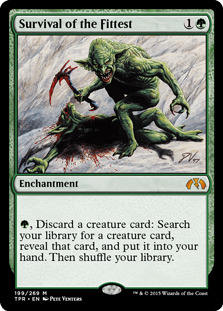 Ravenous Chupacabra and Reclamation Sage : Both of these performed exactly as well as expected; tutorable removal is definitely a useful tool, but I wouldn't want more of it. Big Game Hunter : Was super important for me to win one of the games against Deonmag's Scarecrows... except that it was actually completely unnecessary, as he was at 1 life, I had a Deathrite Shaman in play, and he'd just put a sorcery into the graveyard. 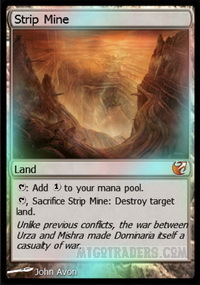 At least this card saved me from that embarrassing oversight being a game-losing embarrassing oversight. KUMAGORO: And this is my own breakdown. 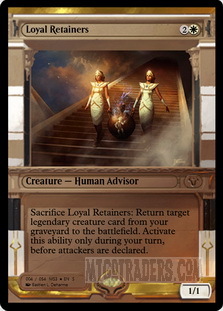 Loyal Retainers : Certainly important, I posit it should be in every Survival deck, because you're bound to have some legendary finisher you want to be able to reanimate starting from just a Survival and any creature. I don't know that I needed four of them, though. I exploited their being in-tribe, but drawing into one of them when there was no target in the graveyard was very discomforting. One or two is the correct number. 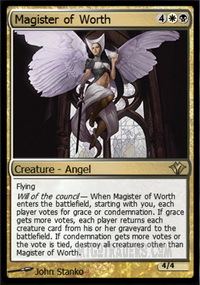 Avacyn's Pilgrim : This felt so out of place as a Noble Hierarch replacement. It still did his job, but not being able to tap for green or black was pitiful. Aegis of the Gods : I wasn't entirely convinced they would be good when I decided to include a couple of these, and after playing them, I'm not entirely convinced they're not, since they never really came up in any meaningful way. Still, considering the number of effects that target your face, forcing the opponent to remove an Aegis first might counterbalance the fact that they're not very useful on the battlefield otherwise. 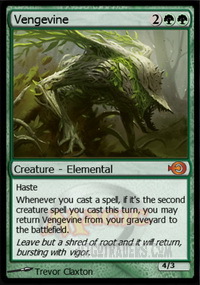 They could be more crucial if their enchantment nature was better exploited with proper synergies elsewhere in the deck, even just a Sterling Grove giving them shroud. 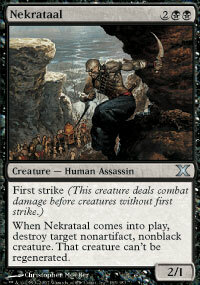 Nekrataal : Not the best removal on legs anymore (Ravenous Chupacabra really stole this guy's thunder irremediably), but it was tribe-mandated. More than once his conditional clauses mattered, unfortunately. Eternal Witness : Always good. 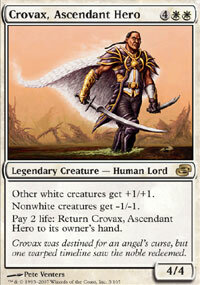 All in all, probably the only other Human, along with Loyal Retainers, worth of inclusion in any Survival deck. 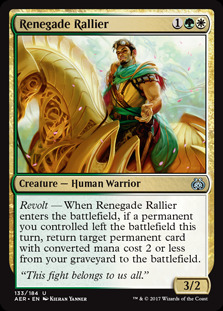 Renegade Rallier : This guy accelerates your mana following a fetch, and is in soft combo with Recurring Nightmare triggering revolt. It never especially shined, though. If I owned the Hierarchs, this would have been another slot to devote to them. 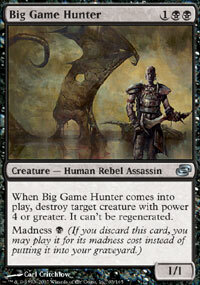 Big Game Hunter : It's vital when it is, useless otherwise. But it's a smart one-of to have in the list. Anafenza, the Foremost : Surprisingly good, in a couple occasions she single-handedly created an aggro route out of nowhere, weaponizing Birds of Paradise. And the anti-reanimation hosing is not irrelevant, so you don't just run her as a beater. I now rank her high on the totem pole of the Survival stars, also due to her being a minor Retainers target. Ethersworn Canonist : A sad result of my being overworried by the bogeyman of storm strategies, when the meta was more about artifacts, which made her a terrible card to draw in those matchups (where of course she would constantly show up in my hand). 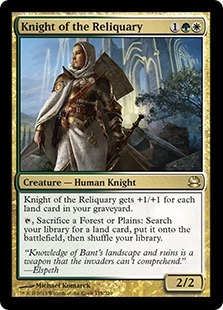 Knight of the Reliquary : Including a creature that's able to tutor up answers in the form of lands wasn't a wrong idea per se. Using Knight of the Reliquary for such a goal proved a bit too clunky. Then again, there weren't many other choices, as Weathered Wayfarer is unreliable and Primeval Titan too slow. Ophiomancer : Undeniably a good card, with several different uses, down to just discouraging attacks. 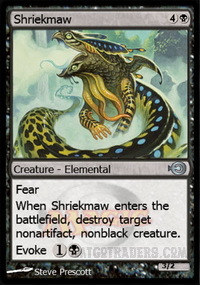 It was also meant as Recurring Nightmare fodder, but it wasn't a well-thought-of plan, because you want to keep switching creatures with ETB effects, not an eternal token. 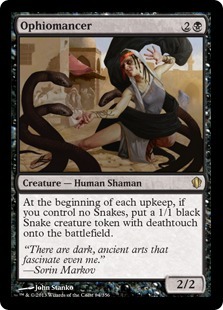 And if the board has been swept, Ophiomancer doesn't help restarting the Nightmare. 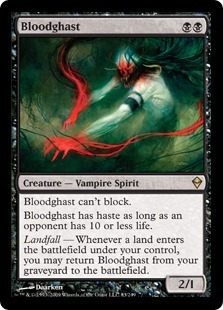 In general, self-recurring creatures a la Bloodghast are useful in Survival, but not imperative. Zealous Conscripts : Truth be told, Conscripts have been protagonists of a few good plays on their own; but they were there first and foremost to combo off with Kiki-Jiki, and that wasn't a plan I ever find myself pursuing. 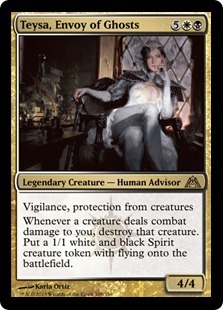 Teysa, Envoy of Ghosts : I did find myself going for Teysa, instead, somewhat surprisingly. She's a good deterrent against aggro, and was able to slow down RDW decks for a few turns, forcing them to hold back until they achieved critical mass. Of course, if I had to spend an off-tribe slot for her, she wouldn't be as desirable. 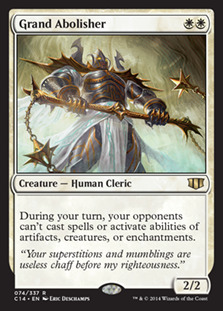 Orzhov Pontiff : Which in the end I didn’t play at all. Why, oh why I made such a stupid mistake? Multiple times a Pontiff would have outright saved me! Birds of Paradise : Your basic accelerator. 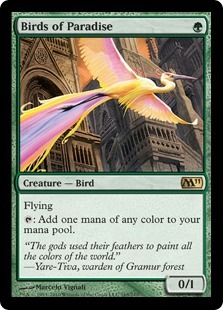 With four colors in the deck, I couldn't even think of running anything else but the trusty Birds. And they have that flying bonus ability that often proves important later. 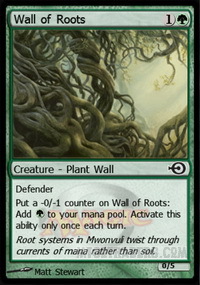 Wall of Roots : It's a great card in this archetype. 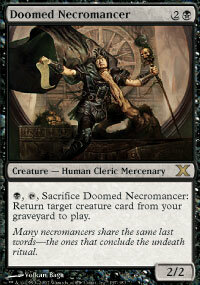 Double Survival activation, buys time against aggro, is a reliable first target for Recurring Nightmare. 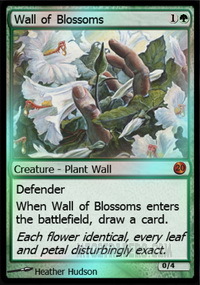 Wall of Blossoms : The original RecSur deck used to run multiple copies of this. It's a good card in general, and digs for one of your missing pieces while populating the board, but I've never been in a situation where I would later want to keep recurring this instead of other stuff. Once you're in Survival mode, card-drawing is not super-important anymore, because you already achieve massive card advantage through your engine, and you likely don't have enough mana resources to do everything you want. Knight of Autumn and Acidic Slime : I was not sure which one to run, so in the end I just ran both. 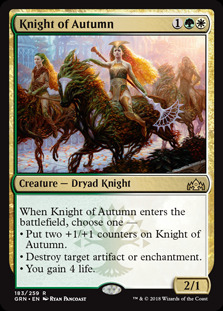 Knight of Autumn is easier to fetch and hardcast to solve an artifact or enchantment problem, and provides the recursion-friendly lifegaining to fight burn. 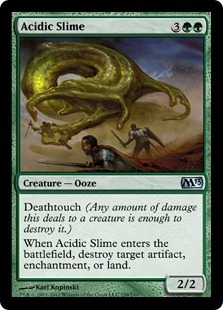 Slime trades with anything ground-based and has the advantage of hitting lands, which is especially crucial in Vintage. Although, as mentioned, I should have probably run Avalanche Riders in the Human slots. 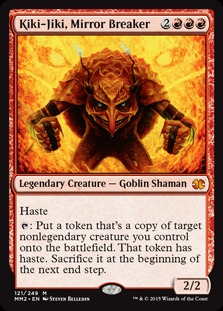 Kataki, War's Wage : This guy should never be underestimated, it's a beast in the format, shutting down Shops and the likes. Never go to Vintage battle without. Akroma, Angel of Wrath : A solid finisher, if a bit too old-fashioned. 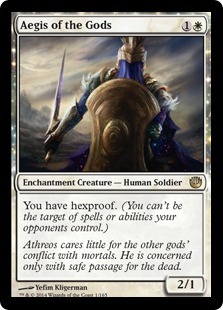 Stands guard while also hitting away from the get-go, is a reasonably fast clock, not too easy to get rid of – unless the opponent is running white, at least. 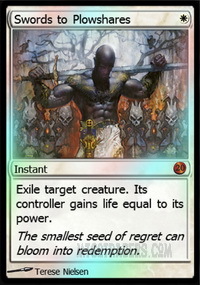 Kiki-Jiki, Mirror Breaker : Kiki-Jiki has a lot of juicy targets in the deck, but he's close to impossible to hardcast, and the Zealous Conscripts combo is not very smoothly assembled (to do it in one turn without exposing it to sorcery-speed countermeasures, you'll need the mana to cast Loyal Retainers plus the mana to cast the Conscripts, or at least Recurring Nightmare them – way less efficient than in a Birthing Pod deck). 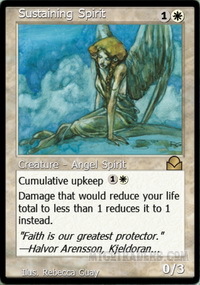 Maybe the Restoration Angel combo would have been better, but it would have required another off-tribe creature. 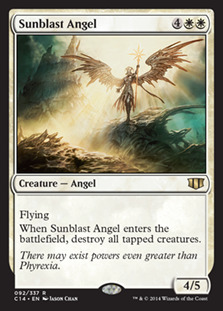 Angel as a shell for Survival seems unlikely... or doesn't? 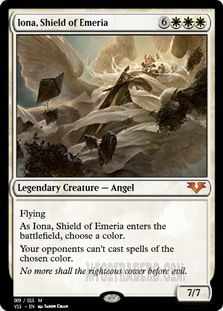 Let's see, we'd have Sunblast Angel , Magister of Worth and the exclusive Angel of Despair to recur... Iona, Shield of Emeria as a major target for Loyal Retainers... Is it feasible? Maybe it is, but even there, I'd probably steer clear of Kiki-Jiki, not least because Restoration Angel can't affect Angels. Here's a possible Angel Survival list. And that's it for this overcomplicated Vintage misadventure. See you next time!